QuartzLock2 in Silver Gray is perfect for this glass and stone mosaic. 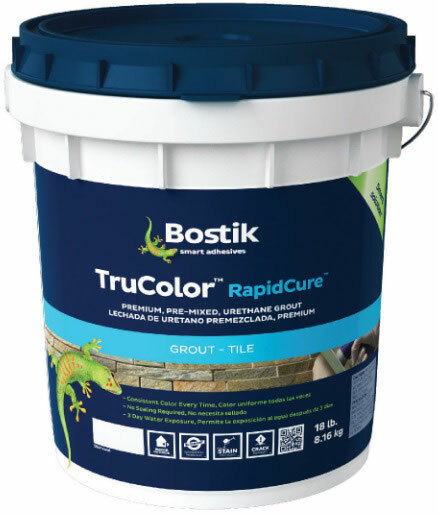 A pre-mixed grout that never needs sealing, urethane grout is highly flexible and stain-resistant. We stock QuartzLock2 urethane grout in several popular colors, and can order many more within a week's time. Urethane grout has several color options, ranging from plain colors to metallic and sparkly varieties. Urethane grout costs more than cement-based or epoxy grout, but makes up for it with unmatched color-consistency, flexibility, stain resistance, and ease of installation. + Color Consistency: From one bucket to the next, your color will be exactly the same! + Unique Options: QuartzLock has a line of sparkly and metallic grout called Dimensions that looks beautiful in glass and mosaic installations. + Crack-Resistant Flexibility: You can install urethane in grout joints ranging from 1/16" to 1/2" wide. Use urethane in tile installations on boats or motor homes to minimize the chance of cracking. + Quick Install: Save for clean up, this is a one step installation process. No need to come back and seal later. + Long Life in-Bucket: You can open a bucket, use some grout, re-seal the bucket, and then use your grout again up to two years later! 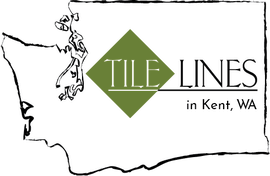 + Green Product: If you're building a LEED certified house, this is the grout for you! - Price: Urethane grout is the most expensive grout (per unit) on the market today. - Color Selection: We currently have access to only one line of urethane grout with 40 colors to choose from, as compared to the 100+ total colors from our 5 different cementitious grout lines. - Sloppiness: Urethane grout is a little difficult to work with on vertical surfaces. - Haze: Approximately one tenth of people installing this grout need the urethane grout haze remover after installation. ...or download and print out our helpful installation guide! Our illustrated guide to working with QuartzLock grout. What is the texture of urethane grout like? Will it scratch glass? Urethane grout has a sandy texture. Be gentle when installing urethane grout with weaker, cheaper glass mosaics and tiles, as it has been known to scratch these glass mosaics. However, we have used urethane grout dozens of times on display boards with glass mosaics, and have not yet had an issue with scratching. Regular QuartzLock2 urethane grout can not be used with stainless steel tiles; it will scratch stainless steel. Dimensions is a softer formula, and can be used with delicate marble tiles, glass, and stainless steel. 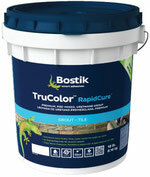 Does urethane grout have color-matching caulk? Do I need to caulk with urethane grout? In most inside applications, urethane grout is flexible enough to be used instead of caulking; for example, in corners in shower stalls, where your backsplash meets your countertop, and so on. For outside applications or for installations where you need an expansion joint, the manufacturer recommends using caulking in conjunction with the grout. StarQuartz does not manufacture a color matching caulking for their grout. However, we work with a third party company that creates caulking options to coordinate with most major grout lines, and stock many colors that match QuartzLock2. Other colors can be ordered within about 2-3 weeks. What about urethane grout haze? How do I clean up the haze? Only about one in seven customers see any haze after using the urethane grout. If you see haze within 72 hours of installation, use Blaze Urethane Grout Haze Cleaner. To reduce the amount of haze left over after your project, dampen the surface of the tile before installing the grout. Work in small, ten square foot sections: grout the area and then clean up with a sponge and water before moving on to the next section. Change your water every 30-50 square feet to reduce the spread of urethane residue. Use the official grout calculator to estimate how much grout you'll need! Round up; the grout calculator doesn't account for spills or mistakes, and it's always better to have a too much instead of too little. Share this amazing product with a friend!